I got mp4 files from what looked like Sony cameras from a crew hired in India, so their video format HD PAL. There are Robotic surgery lectures for website use. The FCP7 does not like these files, so I convert MP4 HD PAL to Apple ProRes HQ and the editing is going much smoother. I have MPEG Slipstream, MIRO video converter, VLC video converter. They did not work with these files. So I tried Aunsoft iMedia Converter for Mac. It worked. This program can output five types of ProRes codecs for FCP- ProRes 422, ProRes 422(LT), ProRes 422(HQ), ProRes 422(proxy) and ProRes 444. I choose HQ mode. I test the output ProRes, the video quality is almost as high as original. Video and audio is in sync without audio cuts-off. I am satisfied with this. Another feature i must mention is the iMedia Converter for Mac allows me preset video and audio profile. For instance, I can freely set frame rate as 23.976, 24, 29.97, 30, 50, 59.94, or 60 that other converters cannot do. Batch conversion is fast. I find that I can convert different types of HD video to ProRes MOV at one time. Below are step-to-step guide to import MP4 HD PAL to FCP 7 using ProRes HQ. Click "add video" or "add folder" to load 4K MXF XAVC. you can also directly drag files to the program, fast. This program also supports batch conversion. Click the “Format” option and navigate the mouse cursor to Final Cut Pro > Apple ProRes 422 HQ(*.mov). Ste 3. Set advance profile. Set proper frame rate is important. The video frame rate is up to 60fps under the ProRes 422 format profile settings. After much verification, here suggests 25P in PAL (30P in NTSC) to keep high video quality and smooth edit in FCP 7. Before converting MP4 HD PAL to MOV, you can also adjust other settings, like video size, video bitrates, audio channels, etc. I prefer to set video bitrates as high quality and choose 5.1 channels for better audio and video quality. 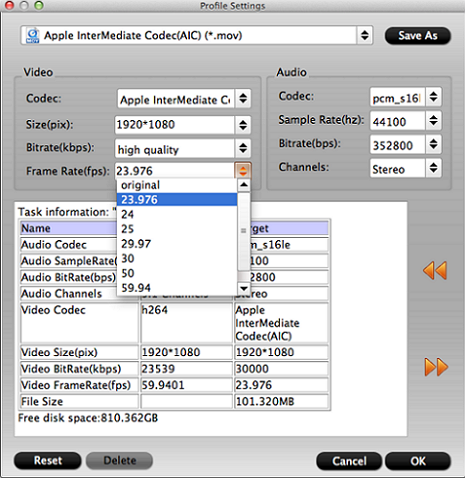 The iMedia Converter for Mac is intuitive. Conversion time is also affected by the power of your CPU and the memory.